Look what I picked up today! My bound PhD thesis! Now, I know that if you got this thesis in your hands, you’d flip to the acknowledgements right away. Here they are in PDF form (If you’ve ever talked to me at all, even just online, check out the second last paragraph of the pdf – you’re all implicitly in there, and as the last people I thank right before my family!) And here is the start of the acknowledgments, with a quote from one of my favourite books. This thesis is the final result of six and a half years of research and lab work. As you look at the figures and graphs on its pages, you will learn what I did while I was sitting in the tissue culture room, what I thought about while reading papers, pipetting or peering down microscopes. But the western blots and confocal images will not tell you who where there with me, encouraging me along the way, even at the moments when I thought I’d never get anywhere with my experiments. These first few pages are for them. Penny is wonderful. And red is an excellent colour. I love the photo of your bookshelf. I think we should have more such photos here! I couldn’t see stains on the thesis from all the blood sweat and tears that I’m sure must have been in ood supply throughout those 6 years? Did you wash them off? I agree that Penny looks lovely, and a nice foil to the bold red colour. Are people now archiving their Ph.D.’s on a regular basis on the Internet? Is that institution-specific or more general? 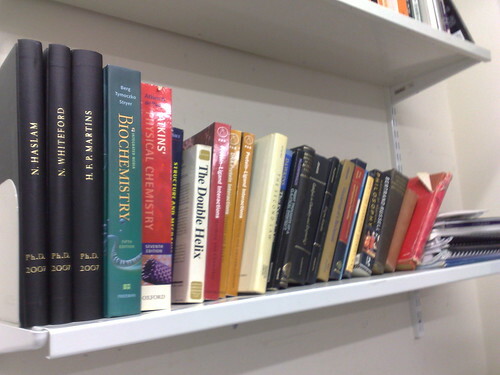 Photos of bookshelf (in lab, to start). Hmm (looks for webcam software installation disk). Congrats, Eva! I remember getting my leather bound copies. I felt like a proper grown up person. Mine was a sombre black binding though. For those of you saucy enough to dare looking, here’s the -naked- plastic bound pre-submission version, beside my undergrad degree, which is also ensconced in a fashionable red cover. Heather: All the theses published in Helsinki, and many published across the Nordic universities are also published as an _e-thesis_, which can often be found through universities’ library websites. “For example”:http://ethesis.helsinki.fi/. fn1. The leather bound version is propping up a cupboard in my parents’ house. Re. e-theses, yes it is a growing trend. “Virginia Tech”:http://scholar.lib.vt.edu/theses/ are the leaders but the British Library is launching its “EThOS”:http://www.ethos.ac.uk/ service. There are thorny copyright issues that people lose sleep over, but I don’t these are so acute in science theses. Congratulations, Eva! I love the photos of the cat tail on the thesis. 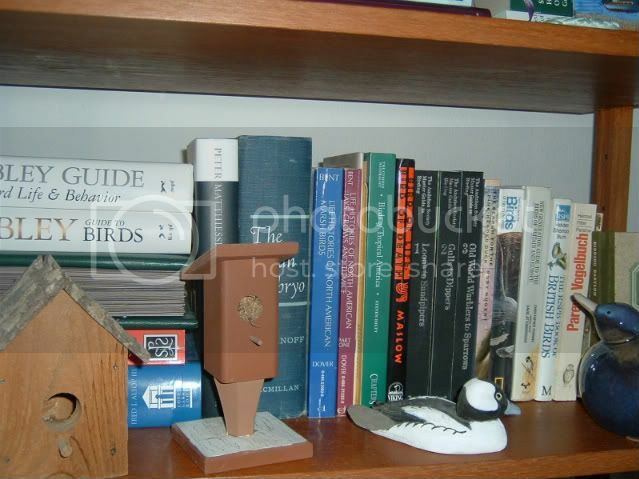 Here’s a photo of my bird book shelf, _sans_ thesis (the subject of which was neural crest cells in avian embryos). I don’t possess a bound copy. I never actually used MBOC, because I didn’t do Biology until my PhD and by then I learned everything from articles. But the cheap bookstore in my neighbourhood (more on that elsewhere much later) had a copy for $10 for sale, and this *is* the edition I *would* have had if I had done Biology in undergrad and used the book. Well done you. Funny, *my* copy of Stryer is blue, but I am old. It’s the third edition, whereas yours is the fourth. And my thesis is kind of a muddy brown colour, the result of going for an antique leather book look, but using whatever non-leather material these things are actually bound in (I suspect yours and mine were done by the same person). The red was a good choice! Oh, and my thesis is also online, although RPG beat me to it by a few years, since mine was PDF’d after the fact by the National Library or whoever it is that archives these things. If you’re having trouble getting to sleep at night, here it is “right here”:http://www.collectionscanada.ca/obj/s4/f2/dsk2/tape16/PQDD_0015/NQ28083.pdf. Warning – flippin’ large PDF. Other warning – very boring. Last warning – the scans of the figures are atrociously awful. KRISTI! You have a copy of THE Romanoff!! Oh, *duh!! * I know your work. I can’t believe it didn’t cross my mind on this of all websites. I’ll be in Paris on Tuesday and maybe will photograph the _other_ bookshelf. All the stuff I didn’t want to bother lugging with me to Toulouse. @ Heather – We had a lab copy of Romanoff, when I was a grad student. The copy in the photo above was obtained fairly recently, in one of my scavenging expeditions. During that same expedition, I also acquired a 1962 edition of Roberts Rugh’s _Experimental Embryology_, as well as a binder containing the photos for the Hamburger and Hamilton chicken embryo stages. Heather> When I defended it was norm that the thesis (or the shorter thing/summary of about 30-50 pages in front of the papers) was published in a pdf ( _sort of like Mike referred to as an e-thesis_ ). In comparison to the printed book though, the pdf is without the manuscripts/published papers since there are copyright and research secrets etc. Example here at the “library at SLU”:http://epsilon.slu.se/eng/index.html No front cover pics in there though, which I find a bit sad. Congrats! I like that the reds are in anti-alphabetical order (Stryer, Amsen, Alberts?)? Looks great though- let us know when it goes live on the University server! Congratulations! And I love the photos. Everyone at my institute turned straight to the acknowledgements page too. I specifically thanked everyone who’d brought cake to work during my PhD, which went down pretty well. My thesis is black, like Mike’s – and has the same University of Glasgow logo inside. I beat you by 8 months, Mike! Unfortunately it’s too tall to stand upright in the dresser we use as a book case, so it’s flat on its side with the atlas, dictionaries and art books, and next to the whisky. Congratulations, Eva – I am sure you and your mom are both very proud of you! My Stryer is blue, too, Cell Biology by Pollard et al. is reddish brown. Other than that, my red books are all things with titles like “Trawling. The Rise and Fall of the British Trawl Fishery” and “Fauna Britannica”. Both of these would look very nice next to your thesis, come to think of it. My first Stryer was … yellow? But it only lasted a year and I got the blue one, and then I got the red one. And congrats Eva—I realize I hadn’t said that. Congrats Eva! You seem to have the colors right, but looks like it’s not thick enough? Stephen—any chance of a scan of that? That does my geek heart good. Lovely (I’m a little biased though)! And I’ll check page 1005 when I get home. I’m a blue Stryer lass- I left my Stryer in the UK when I moved (it wouldn’t fit in my suitcase), but (joy!) found a blue Stryer on the street in a pile of books last year. And, I don’t mean to throw the cat among the pigeons, but I feel compelled to ask. Does everyone _really_ like Stryer? It was my favourite text book in undergrad chemistry! Everything else I had was easy (Zumdahl – pictured – would have gotten rid of it but my edition is autographed) or scary/hard (physical chemistry, Atkins) or deadly boring (some analytical chemistry books). I only kept organic chem, physiology, and Stryer. Oh, and math, apparently. The bioinformatics and mol. bio. 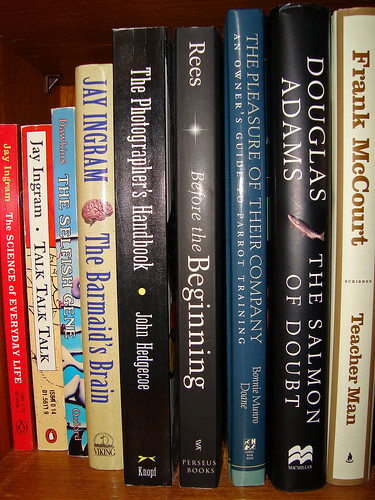 books on my shelf are all things I got later. Before that, I had studied about half of the book for a first year biochem course, when I was still planning on being an environmental scientist and saving the planet. The book won me over with a question about Eeyore and Candide and chemotaxis. It was Stryer that made me switch my interest from environmental science to Biochemistry. Later, I studied the entire book a _third_ time for the GRE exam to go to Canada. Ah, I had forgotted that your undergraduate degree was chemistry (not biochemistry). This preference for other books than Stryer was why I wondered whether really he has such universal appeal. My impression was that for a long time Stryer was the _only_ biochemistry text book? Now there are more competitors. Erika, for interest, what was your preferred biochem text? 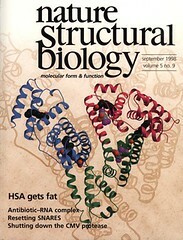 I liked Lehninger’s “Principles of Biochemistry”:http://bcs.whfreeman.com/lehninger/ and others in my year preferred “Voet & Voet”:http://bcs.wiley.com/he-bcs/Books?action=index&itemId=047119350X&itemTypeId=BKS&bcsId=1847. (The latter is good for what we called Biological Chemistry – kinetics, thermodynamics and so on). I had an interesting discussion with my Grandfather, who worked in academia, about textbooks. He said that in his experience his students did not get on so well with American textbooks and often got on well with books by German authors or translated from the German. I have found this reflects my experience, which I found curious. I prefer Lehninger as well; that was the required text for the undergraduate biochemistry course I took. There wasn’t perfect overlap between the biochemistry courses at my undergraduate and graduate universities, and therefore I had to take part of the course in graduate school, where Stryer was the chosen textbook. Nevertheless, I went back to Lehninger. Congratulations Eva! And that is an extremely _sharp_ looking thesis. Excellent choice and, I’m sure, excellent work contained within. I had no experience with anything but Stryer, but I am not really a biochemist _per se_. For me, Stryer seemed good – basic enough, but in-depth enough at the time. Yup, those were the 2 camps when I was an undergrad (Stryer-ists and Lehninger-ers, it was pretty much Montagues v Capulets without the love part). But as Richard says by year 2 we didn’t really use Stryer any more, so it’s a nostalgia thing. Congratulations on your -baby joy- new arrival. I never considered that you might tell the age of a biochemist by the hue of his/her Stryer. I’m one of the blue generation. The red edition was always a bit new-fangled for me. RNAi? Wassat? Matt, there’s no RNAi in my edition either (second printing, 1995) =) I’m only one or two years away from the blue one. I’ve seen it on people’s shelves – people who were in university at the same time I was! Philip, it might differ per department, but we were allowed any colour we wanted at Biochem. My coworker mentioned Voet & Voet as well in response to my thesis colour explanation, although it took me a few seconds to realize that was what she said. I had never heard those names (that word) being pronounced in English before, and tend to read them in Dutch in my head. “Voet” is Dutch for “foot” and sounds just like that. But the name “Voet” sounds like “wode”, apparently. Hm, I’d thought it was Adams’ _Last Chance To See_, but I see now it was the rather lame _The Salmon Of Doubt_. And Dawkins crept in their somehow too – not one of my faves. Ah well. Forgot to mention, Sir Martin Rees was the honourary graduand at my convocation. His book is rather dense, but full of interesting things. Am I the only one who can’t remember what colour my textbooks were, and didn’t keep a single one past undergrad? (I sold them back to the University bookshop for a fraction of what I’d paid for them). Our undergrad profs drummed it into us from day one that we should mostly be consulting the primary literature rather than textbooks after the first year, although a couple of second year courses did require a new textbook. Well, if you had Stryer, you would have had the first printing of the red one, probably, since you’re 1 year older than I am. Or an old edition of the blue one. I can’t even remember if I had Stryer. I’m leaning more towards Voet and Voet, although both sound familiar. Of course, I switched from biochemistry to genetics after my first term, so Genes V was more my cup of tea. You’d remember Stryer if you had it Cath! If your memory needs a jog, come check out my bookshelf (Blue 3rd ed). I lugged it all the way over here from Australia! _Genes V_? Ack! Genes III, puh-leeeeeze. Actually I never used it, but I did buy a copy at the U of T bookstore for my (not yet) wife and one of her classmates, whose own university bookstore had sold out of it. 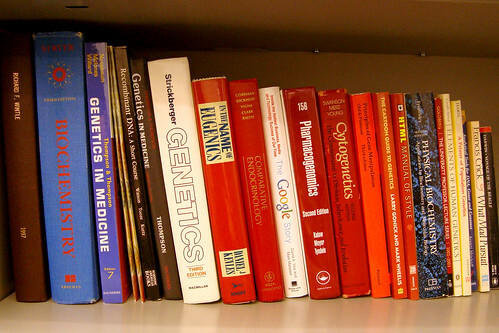 Strickbergers, _Genetics_, 3rd edition for me – not one of my faves though. They’re up to Genes IX now, which is just wrong. I bet it says all kinds of weird things about RNA. Genes (mine is VIII) is another than I like. Cath, do you want me to look up RNA in the index? I wonder if Genes X will be aqua-colored? Great colour, and congratulations on the final product. Red is a GREAT colour… (and you found a nice place for _”The Thesis”_ on your shelf). That’s how I read it, Erika, to start. RW: I’m feeling very cheap, now, when I see your proportion of hard- to softcover books, and that they’re not two deep on the shelf. I should pull up all those book images in a post to make them more visible. Hmm….or do a little project, in which I feature people’s bookshelves and talk about them. I totally forgot about my bookshelf project! My excuse is: I’m organizing an actual physical event, with rooms and food and stuff, which has taken over the projects part of my brain. Also, your thesis doesn’t match your Stryer! My thesis doesn’t match much of anything, except perhaps some three-day-old dog excrement. I should have gone with bright blue, even though I don’t care much for Stryer and only read the bare minimum necessary. There are two books in that photo that feature chapters authored by NN members – can you spot them? Hint: one of those authors is a NN blogger.